As a highly renowned international exhibition for wine production & fruit/vegetable farming and processing in China, SITEVINITECH CHINA 2018 featured 90 exhibitors with over 200 brands. From 13th to 15th June, SITEVINITECH CHINA 2018 has organised in Ningxia for the 4th time and suceessfully held its 7th edition at the Yinchuan International Exhibition Center. SITEVINITECH CHINA 2018 is organised by Comexposium China, and is strongly supported by Grape Industry Development Bureau of Ningxia Hui Autonomous Region and the International Organisation of Vine and Wine. As a highly renowned international exhibition for wine production & fruit/vegetable farming and processing in China, SITEVINITECH CHINA 2018 featured 90 exhibitors with over 200 brands from Germany, France, Spain, Israel and China to showcase the first class viticultural and vinicultural equipment, covering an entire industry chain from vineyard mechanization to the final wine packaging. 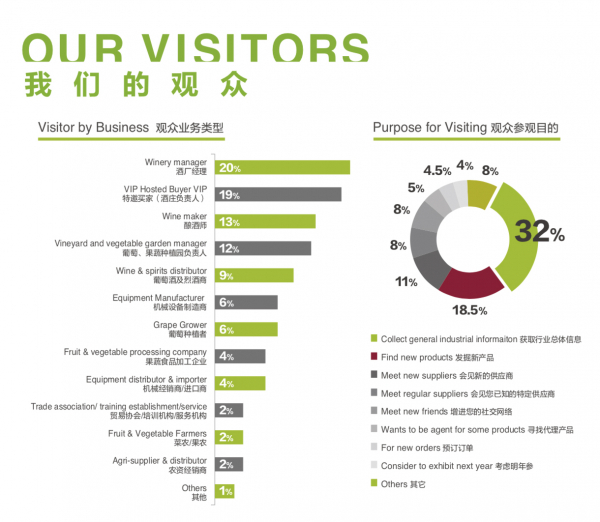 Why exhibit at SITEVINITECH China? SITEVINITECH is the only professional trade show for the wine and fruit & vegetable sectors in China. Increase your revenues, expand your network, meet your customers and find new outlets for your products and services. 2nd largest wine-growing area in the world in 2015 with 800 mha. International groups have already started to invest into the Chinese wine business: Pernod Ricard, Groupe Castel, Moët Hennessy, Baron de Rothschild, etc. Benefit from extensive media coverage in China in the professional press sector. Representative of trade and government bodies, journalists, etc..
You are interested in SITEVINITECH China?